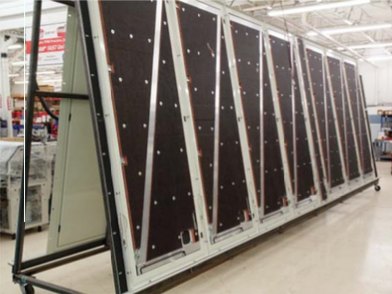 A global diversified equipment manufacturer had an on-site fuel cell enclosure application. Attempts at offshoring such a large and complex product proved fruitless. With difficult size and environmental requirements (i.e., withstanding 120 mph winds, a snow load of 2.9 kPa, extreme hot, extreme cold, rain, humidity), the company chose PEKO to develop and manufacture the enclosures for the fuel cell systems. The enclosure design required special attention to detail as it needed to meet strict environmental requirements. PEKO’s engineers set their focus on meeting the precise and challenging, strength and dimensional specifications. With an in-house engineering team well versed in cost control, many iterations of finite element analysis of the doors, panels, roof sections, stiffeners and frames were applied to optimize strength vs. cost and weight. PEKO’s vertical integration and ability to provide the enclosure’s top-to- bottom manufacturing needs through in-house sheet metal, machining, powder coating, and assembly capabilities put the customer at ease. PEKO produces batches of these units in weeks’ time with the quality and precision demanded by the customer. PEKO’s flexibility also adapts to the customer’s fluctuating production needs. The “one-stop shop” setup at PEKO allows the customer to get the engineering resources needed in addition to the contract manufacturing solution for this product’s requirements. Aggressive lead times are met and the product continues to be manufactured effectively. Through its well-designed manufacturing processes, PEKO is able to rapidly respond and adjust production up or down based on customer demand fluctuations.